The son of a multimillionaire Omaha businessman long ago turned his back on materialism and took to the streets. 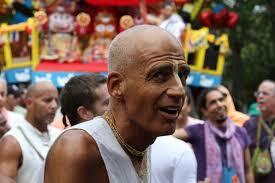 For four decades, he chanted a daily mantra as a robe-wearing Hare Krishna. Father and only son endured a long estrangement, though the rift eventually eased. And so at the 2004 funeral of Phil Sokolof, son Steve — or Siddha Vidya Prabhu — got up to speak. The congregation at Temple Israel, where Steve had been bar mitzvahed in the Jewish faith at 13, sat in tense anticipation of what he might say. But he disarmed everyone with warmth and humor. Attendees laughed warmly, and the son spoke gently of a dad whose career and life were so different from his own. After the funeral, “Siddha Vidya” returned to Miami and his ascetic lifestyle. Now the father-son saga has come to a close. Steve, who will be remembered at a 1 p.m. memorial service today in the Omaha synagogue of his youth, died in Miami on March 11. No, Phil and Steve weren’t much alike. Phil became nationally known for fighting cholesterol — even buying a $2.5 million commercial in a Super Bowl — and lived to 82. Steve died at 64, but friends and relatives once feared he might not live even to 24. Out of the blue, though, Krishnas found him — and transformed his life.